Experience the highlights of Zimbabwe's Victoria Falls as well as the many wonders of Botswana with a custom itinerary that will enable you to see as much as you can during your stay. Your adventure begins with a visit to the famous Victoria Falls before embarking on a safari adventure to Selinda Spillway, Khwai Community Area, and the Central Kalahari Game Reserve. You will have the opportunity to immerse in breathtaking scenery, once in a lifetime wildlife viewing and spend each night in exceptional lodges throughout the region. Welcome to Zimbabwe! Upon arrival at the airport, you will be picked up and transferred to the Gorges Lodge. Check in and begin enjoying your Victoria Falls experience. The enchanting Victoria Falls features the largest sheet of falling water on earth. This mesmerizing spectacle is something that simply cannot be missed on an authentic discovery of Africa. The sheer mass of water cascading down the 100 meter drop across nearly 2 kilometers, generates a thunderous roar and a magnificent spray of water that can be seen for miles. This world renowned attraction promises to captivate you from your very first glimpse of the "smoke that thunders". During your stay at the Gorges Lodge, a guided tour of the Victoria Falls is included (park entry fee included) as well as curio shopping at the craft village, visit the local village, a school tour, traditional dancing display, gorge walk with sundowners and snacks, black eagle viewing with sundowners and snacks and a sundowner cruise on the Zambezi (river usage fee included). Today you will check out of the Gorges Lodge and transfer to the Kasane Airport for your local charter flight to the Selinda Explorers Camp Airstrip. On arrival, you will be met by a camp representative and transfer to the camp. The Selinda Spillway is a river that flows in two directions. 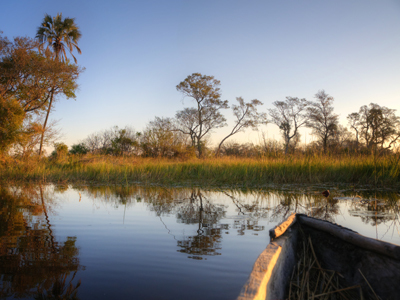 This ancient waterway receives water from both the Okavango Delta and Linyanti/Kwando rivers, in opposite directions. In 2009, for the first time in nearly three decades the Selinda Spillway flowed in full, connecting these two ancient waterways. Then, the ample rains of the first half of 2010 and 2011 ensured that the Selinda Spillway continued to flow. This lifeline provides sustenance for a wide range of species and is a stunning addition to the Selinda Reserve's magnificent ecosystem. Selinda Explorers Camp is poised in a remote, treasured location on the famous Selinda Spillway, under canopies of jackelberry and mangosteen trees. As the lifeline of the Selinda Reserve, the Selinda Spillway is a crucial gathering point for the wildlife of this pristine 320,000-acre Reserve. 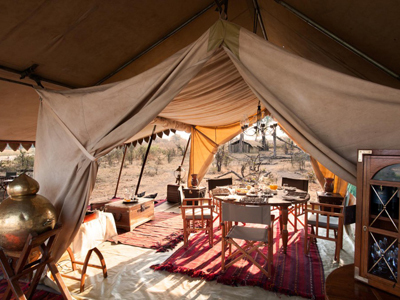 This classic camp, consisting of only four custom-designed tents, will take you back to the feel of authentic safaris, with a modern twist and personalized hospitality. In balance with the wild location of this camp, the activities on offer are concentrated on getting back in touch with nature. Guided walking and canoeing tours are popular, but day and night game drives are also available to explore the eastern reaches of the Selinda Reserve, where there is an extensive network of tracks. It is a wildlife hot spot, with huge herds of elephants and buffalo, lion, wild dog, sable and roan antelope, all frequently spotted. Enjoy two wildlife activities per day during your fully inclusive stay, alongside all meals, local brand drinks and conservancy fees. Today you will check out of the Selinda Explorers Club and transfer to the Selinda Explorers Camp Airstrip for your local charter flight to the Machaba Camp Airstrip. On arrival, you will be met by a camp representative and transfer to the camp. The Khwai Concession, formed by local villagers, is an 18,000 hectare reserve situated on the eastern border of the Moremi. 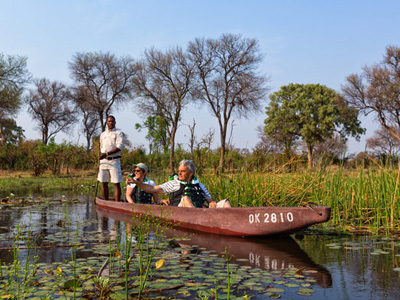 A paradise of grasslands, floodplains, lagoons and forests, the focal point of the area is the Khwai River, which passes through the region, an extension of the Okavango River. This is the vital waters form the boundary between the reserve and the Khwai village. Community run, the reserve focuses on conservation, eco-tourism and sustainability. This respect for the earth and love of the land, has resulted in a concession offering superb game viewing, with a vast variety of wildlife from all levels of the food chain. As this is a private concession, night drives are conducted, rewarding you with the added benefit of seeing the nocturnal animals, who typically keep a low profile during the daylight hours. Perfectly situated overlooking the famous Moremi Game Reserve, your time spent at the Machaba Camp will include endless opportunities for game viewing, whether you are out on a safari activity or not. Throughout the day, sit back and admire the parade of animals coming down for their daily drinks at the river in front of camp. During your stay at the Machaba Camp, you will have a variety of activities to choose from. These includes day and night game drives, visits to the local community and short mokoro (traditional canoe) excursions. Walking safaris are available as well, though subject to prior arrangements. All meals, local brand drinks, two scheduled safari activities per day, park fees and laundry services are included in your stay. The Khwai Community area was established by the former inhabitants of the Moremi Game Reserve, the River Bushmen, and is now managed by the community through the Khwai Development Trust. The wildlife experience here offers the same excitement and possibilities as inside the reserve, with the key advantage being the freedom to participate in walking safaris, off-road driving and night drives, as the area is not governed by National Park rules. Today you will check out of the Machaba Camp and transfer to the Machaba Camp Airstrip for your local charter flight to the Kalahari Plains Camp Airstrip. On arrival, you will be met by a camp representative and transfer to the camp. The Central Kalahari Game Reserve is the second largest protected wildlife area in the world, covering 51,800 square kilometers. It is one of the most remote and unspoiled parts of Africa. The desert's beauty is uncompromisingly harsh, but utterly breathtaking and has captured the imagination of explorers for centuries. The Kalahari is characterized by vast open spaces, endless horizons, rolling golden grasslands and flaming sunrises and sunsets. Within this remote and expansive landscape, you will discover a rich diversity of life. The Central Kalahari is home to numerous unique desert dwelling species, each with their own remarkable adaptation to survive the parched landscape. 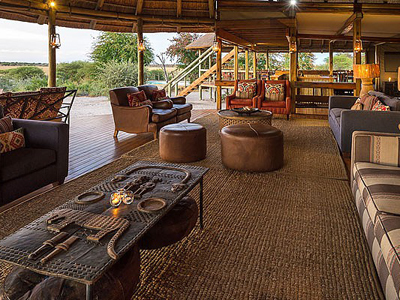 In summer, Kalahari Plains Camp is simply unbeatable as a wildlife destination. With the advent of their rains, the desert truly comes to life. Short grasses attract plains game such as springbok, gemsbok and wildebeest that converge in their hundreds and thousands here to feed, which attracts predators such as lion and cheetah. Although, thanks to the diversity of habitats, healthy game populations move through the area and are present all year long. Guided game drives unlock the fascinating wildlife treasures found in this incredible area. 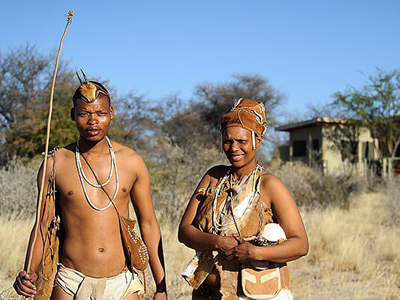 San Bushman experiences that are also available, can provide you with the unique insights into the culture of these fascinating people. You'll have a lot to do here, so enjoy! Your fully inclusive stay includes all meals, drinks, game drives and bush walks. Excludes all premium imported wine, champagne and spirits. Today you will check out of the Kalahari Plains Camp and transfer to the Kalahari Plains Camp Airstrip for your local charter flight to theMaun Airport. On arrival, you will check into your outbound international flight home. We hope you enjoyed your safari experience. Welcome to a Zimbabwe escape of living on the edge! Gorges Lodge is only a 30 minute drive from Victoria Falls town and offers a unique experience from an idyllic base on the edge of the Batoka Gorge - a perfect choice for your Victoria Falls safari adventure! At Gorges, you are invited to relax away from the hustle and bustle of town and settle into a peaceful atmosphere nestled in a landscaped garden. Gorges is famous for its spectacular views and the attentive staff on property are renowned for their warm hospitality. Whether you are enjoying a cup of coffee at sunrise on your private veranda or a cool refreshment by the pool at sunset, you will be drawn to the stunning views of the impressive Batoka Gorge and the fierce Zambezi River below. There’s an old saying that great things come in little packages… Selinda Explorers Camp is no exception! Small – catering for only 8 guests – it's “wow” factor lies in the unique and memorable experience it offers guests. The camp is decorated with expedition-style decor, such as vintage travelling trunks, lending an authentic atmosphere to the camp’s traditional canvas tents, all becoming a part of the experience. The camp is located on a remote stretch of the Selinda Spillway, close to the heart of the pristine private Selinda Reserve. Under a canopy of towering jackalberry and mangosteen trees, the four custom-designed tents embody the philosophy of exploration, sitting squarely on the earth, connecting guests directly with the pulse of the wild. The tents are spacious and stay true to the classic age of safari, when the journey was more important than the destination. 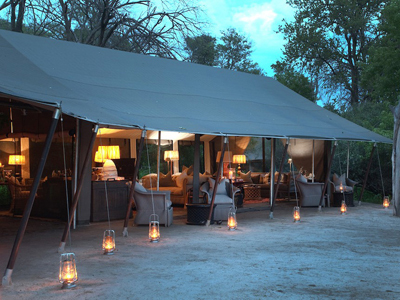 Machaba Camp is situated in the game rich Khwai area, on the eastern edge of the Okavango Delta. The name Machaba is the local Setswana name for the Sycamore Fig Tree, which is the tree of life. The camp was built with a focus on the classic 1950’s style, featuring luxury safari tents, en-suite bathrooms and romantic outdoor showers. All the tents are situated on the ground and the pathways to the tents meander between beautiful large riverine trees. All 10 luxury tents are situated in the beautiful riverine tree line on the Khwai River, overlooking the famous Moremi Game Reserve. 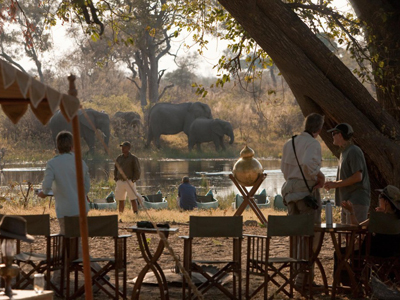 From these tented verandas, you can watch the daily parade of animals coming down to drink at the river in front of camp. The camp consists of 8 luxury twin tents and 2 luxury family tents. Kalahari Plains Camp is set in a remote part of the diverse and productive Central Kalahari Game Reserve (CKGR) and offers some of the best summer wildlife viewing opportunities in Africa. Located in the Kalahari Desert biome in the central part of Botswana, this reserve is the largest conservation area in the country and one of the largest in the world. Its star attractions include the legendary Kalahari black-maned lion as well as some of the world's best cheetah viewing. Kalahari Plains Camp is perfectly situated overlooking an immense pan with endless horizons and beautiful skies. It comprises eight en-suite canvas units with a sleep-out above each from which to enjoy moonlit or star-studded nights. The main area consists of a lounge and dining area with a swimming pool and deck. Solar power provides all the electricity and hot water in the camp and insulated canvas walls and roof keep temperatures inside the units comfortable. This is just one of many authentic travel experiences offered by Global Basecamps. If you are interested in more unique destinations to Botswana with unprecedented planning and extraordinary service visit our main Botswana safari page to browse other sample trips.